Officers in Elgin have issued “numerous” fines in the town centre after acting on complaints from businesses and regular shoppers. Last night the action was welcomed as a way to try and stop drivers from “abusing” the free parking spaces provided in the heart of the town. Meanwhile, police have warned motorists to consider where they park as the town centre gets busier with shoppers in the coming weeks. Elgin City South councillor John Divers said: “This has been going on ever since the traffic wardens stopped patrolling the streets. “There’s a reason why the spaces can only be used for a set period, usually 30 minutes, yet some people just see it as an opportunity to leave their car there all day. The tickets issued by the police cover the bays marked in the streets in and around Elgin town centre. 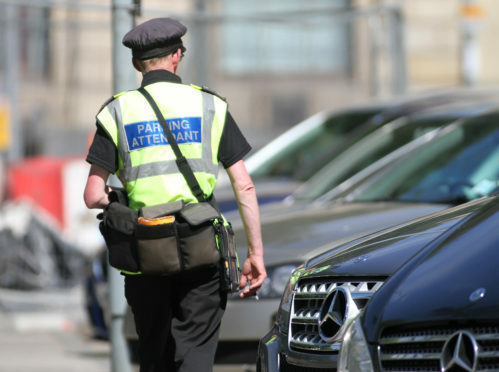 Moray Council is responsible for issuing fines for motorists who do not obey the restrictions in pay and display car parks. The local authority launched a revamp of parking prices in Elgin this year, including slashing the daily charge at the Batchen Lane multi-storey to £1 and increasing the cost at other car parks, in an attempt to encourage people to make best use of the spaces provided. A police spokesman said the recent drive had been prompted by issues being reported to them. He said: “Due to continued complaints, officers have issued a number of parking tickets for contraventions of the restrictions in Elgin town centre.